Lethal Weapon 3 is a 1992 American buddy cop action comedy film directed by Richard Donner, starring Mel Gibson, Danny Glover and Joe Pesci, with Rene Russo and Stuart Wilson in key supporting roles. It is the third installment in the Lethal Weapon film series. In the film, which is set a few years after Lethal Weapon 2 (1989), Martin Riggs (Gibson) and Roger Murtaugh (Glover) pursue Jack Travis (Wilson), a former L.A.P.D. lieutenant turned ruthless arms dealer, during the six days prior to Murtaugh's retirement. Riggs and Murtaugh are joined by Leo Getz (Pesci), as well as Internal Affairs Sergeant Lorna Cole (Russo). Unlike the first two films which received generally positive reviews, Lethal Weapon 3 was met with mixed reviews, but was a box office success, grossing over $320 million worldwide. It was the fifth highest-grossing film of 1992 and the highest-grossing film in the Lethal Weapon film series. The film is followed by a sequel, Lethal Weapon 4 (1998). A week before his retirement, L.A.P.D. 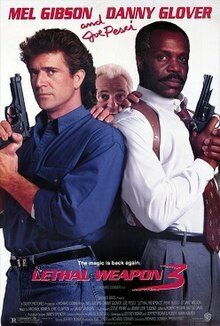 Sergeant Roger Murtaugh (Glover) and his partner Martin Riggs (Gibson) are demoted to uniform duties after trying to defuse a bomb before the bomb squad arrived, causing the destruction of an otherwise empty office building. While on street patrol they witness the theft of an armored car, and help to thwart the crime assisted by armored car driver Delores (Delores Hall). One of the two thieves gets away, but the other is taken into police custody. The suspect is found to be a known associate of Jack Travis (Wilson), a former LAPD lieutenant who is believed to be running an arms smuggling ring in Los Angeles. The department is further concerned that the thieves were using armor-piercing bullets, informally referred to as "cop killers". Riggs and Murtaugh are re-promoted and assigned to work with Sergeant Lorna Cole (Russo) from internal affairs to track down Travis. Travis is currently negotiating with mobster Tyrone (Millar) regarding his arms deal. The armored car thief that escaped is brought to Travis, who subsequently kills him in front of Tyrone for putting the police on his trail. Travis then uses his old (but still valid) police credentials to enter the interrogation room and kill the suspect in custody before he can be interviewed. Travis is unaware that closed-circuit cameras have been installed in the station, and Cole is able to affirm Travis' identity. While the three are reviewing the footage, their good friend Leo Getz (Pesci) - who has been helping Murtaugh sell his house - arrives and immediately recognizes Travis from several prior business deals and his love of ice hockey. Riggs and Murtaugh narrowly miss capturing Travis at a hockey match that afternoon, but Getz has provided them with information of a warehouse Travis owns, which they suspect is where he has stored his arms shipments. Riggs and Murtaugh contact Cole for backup before they raid the warehouse, and then stop to get something to eat while they wait for her. As they wait for their food, they witness a drug deal which they step in to stop. A gun fight breaks out, and Murtaugh kills one of those involved who had fired back at them, while the rest escape. Murtaugh is shocked to find the dead man is Darryl, a close friend of his son Nick. With Murtaugh emotionally distraught, Riggs goes with Cole to the warehouse, where they successfully overpower Travis' guards and secure his next arms shipment delivery. That night, Riggs and Cole find they have feelings for each other and sleep together. Riggs later goes to Murtaugh, who is still overwhelmed with guilt, and helps to counsel him in time for Darryl's funeral. There, Darryl's father passionately insists that Murtaugh find the person responsible for giving Darryl the gun. Cole finds that Darryl's gun, the armor-piercing bullets, and the arms they recovered were originally in police custody, meant to be destroyed, and were likely stolen by Travis; they assure that his credentials are completely revoked from the system. They further tie the guns to Tyrone and interrogate him. Tyrone quickly reveals what he knows of Travis' plans, including an auto garage where many of his henchmen work from. Riggs, Murtaugh, and Cole are able to take several of the men into custody there. Meanwhile, Travis finds he cannot use his credentials anymore, and has one of his men hack into the computer system to find another arms storage area. He then forces Captain Murphy (Steve Kahan) under gunpoint to take him to this new facility so he can steal the guns using Murphy's credentials. Cole finds the evidence of hacking and Murphy's absence, and the three, along with a rookie cop who looks up to Riggs and Murtaugh, go to intercept Travis. They are able to rescue Murphy and stop Travis and his men before he can take the weapons, but the rookie is killed as they give chase, and Riggs and Murtaugh vow to stop Travis. Getz provides information on a housing development under construction by a company owned by Travis. Getz tries to join them but they shoot his tires out to stop him from coming. Riggs and Murtaugh instead bring Cole along to infiltrate the site at night, and find themselves met by Travis and his men who have been waiting for them. A large-scale gunfight breaks out, in which Riggs sets the construction site on fire and most of Travis' men are killed. Cole appears to be shot by Travis and falls, inciting Riggs. When Travis uses a bulldozer to chase down Riggs, using its blade as a bullet shield, Murtaugh tosses Daryl's gun, now loaded with the armor-piercing bullets, to Riggs, who then shoots and kills Travis through the blade. Cole is found to be alive and safe, having worn two protective vests. Riggs admits his love for her as she is taken away in a chopper. The next day, Murtaugh's family are celebrating his retirement, when Murtaugh reveals to Getz that he has decided to not sell the house and stay with the force, preserving his partnership with Riggs. As the film ends, Riggs announces to Murtaugh that he and Cole are in a relationship. The movie was filmed from October 1991 to January 1992. Director Richard Donner is an animal-rights and pro-choice activist, and placed many posters and stickers for these causes in the film. Of note are the T-shirt worn by one of Murtaugh's daughters (the actress's idea), an 18-wheeler with an anti-fur slogan on the side, and a sticker on a locker in the police station. In the film's first scene, Riggs accidentally sets off a bomb that destroys the ICSI Building. The ICSI Building was actually the former City Hall building of Orlando, Florida, located at the intersection of Orange Avenue and South Street in Downtown Orlando. Warner Bros. decided to use the destruction of the building in the film, and as a result paid for the demolition. From August to October 1991, the production crew fitted the old Orlando City Hall building featured in the opening scene with carefully placed explosives to create the visual effect of a bomb explosion. Bill Frederick, then mayor of Orlando, Florida, was the policeman who sarcastically claps and said "Bravo!" to Murtaugh and Riggs after the explosion. The building was demolished so that it would collapse slightly forward (toward Orange Avenue), minimizing the chances of it damaging the new City Hall building, built directly behind it. The space was cleared out and became a plaza for the new City Hall, with a fountain and a monument. The film's climax scene, where an under-construction housing development is set ablaze, was filmed at an unfinished housing development in Lancaster, California. The unfinished houses, which had been sitting abandoned and slated to be torn down, were coated in flame retardant and propane gas lines to ensure that the houses could withstand re-shoots. The original homes were eventually demolished and was eventually redeveloped into another housing development. During the closing credits, Riggs and Murtaugh drive up to an old hotel where another bomb has been placed. Before they (their doubles) can exit the car, the bomb explodes and destroys the building. The hotel was actually the former Soreno Hotel in downtown St. Petersburg, Florida. The film's producers agreed to help with the cost of the 68-year-old building's implosion for the purposes of their film. Jeffrey Boam's first two drafts of the script were different from the final film. The character of Lorna for example was not a woman in original drafts, but the original character still had the same personality and was just as lethal and crazy as Riggs, making him his match. Riggs also had an affair with Roger's daughter Rianne and a few parts in the final film where Roger suspects that Riggs and Rianne are together are only parts left from the original drafts. Director Richard Donner demanded some big changes on the script which included changing the original character of Lorna (who had a different name in earlier drafts) into a woman and turning her into Riggs' girlfriend. He also re-worked the script to be less story-oriented and not focus on the main villains but instead on the relationship between Riggs and Murtaugh. He also toned down action scenes from the script and brought back Leo Getz into the story. All of his scenes were written in afterwards. In the original script Leo had left L.A. for New York. Boam had some disagreements with changes that Donner made but he was not against it. Boam was fired after he wrote his first two drafts of the script. One of the reasons for this was because Donner wasn't interested in the script and he disagreed with some parts of Boam's original draft. After another writer, Robert Mark Kamen was hired to re-write the script, Boam was called to return to work on it again. The filmmakers realized that Kamen's re-writes were not working. Boam asked to work alone on the script and ended up constantly changing it from October 1991 until January 1992 while filming was taking place. These changes also occurred during the filming of Lethal Weapon 2. According to Kamen in a 2012 interview for craveonline, many of his writing contributions ended up in the final film. Kamen also wrote many parts of the previous film in the series, with the most significant portions being the South African villains. Screenwriter Jeffrey Boam is credited twice in the 'screenplay by' credits. This is because he did one draft by himself (granting him the first credit) and a second draft collaborating with Robert Mark Kamen (granting him the second credit). In this rare scenario, Boam was hired to rewrite his own script with a second writer. After receiving the unusual writing credits, the advertising department assumed it was a misprint and produced posters with the credits "Story by Jeffrey Boam, Screenplay by Jeffrey Boam and Robert Mark Kamen". After a few of the posters had been sent out, the WGA contacted the department, telling them that the initial credits were the correct ones, and ordering the posters to be recalled and destroyed. Carrie Fisher was an uncredited script doctor on the film. Russo received martial arts training for a month before shooting from Cheryl Wheeler-Dixon, who had a karate background and was a former kickboxing champion, and Wheeler-Dixon was also her stunt double. Brazilian Jiu-Jitsu instructor Rorion Gracie, who had taught Gibson and Gary Busey in the first movie of the series in 1987, also provided training to Russo and acted as stuntman for a fight scene. For promotion of the film, theater lobbies featured a 3-D cut out of the film poster of Riggs and Murtaugh posing with their guns and Leo Getz peeking from the background. On the display, there was a motor which helped Leo's head bob up and down from behind them. The $35 million film was a big box-office success, earning $145 million. Although slightly less than the $150 million domestic gross of the first sequel, it was nevertheless the second-most successful summer film of 1992 (after Batman Returns) and the fifth most profitable film of the year, as well as the highest-grossing in the film series worldwide with $320 million worldwide. The film was met with mixed to positive reviews. It currently holds a 57% approval rating on Rotten Tomatoes based on 44 reviews with an average rating of 5.5/10, as well as a weighted average rating of 36 out of 100 on Metacritic from 18 critics, indicating "generally unfavorable reviews". Audiences polled by CinemaScore gave the film an average grade of "A-" on an A+ to F scale. Roger Ebert of the Chicago Sun-Times gave the film a positive review, awarding it 3 out of 4 stars. Lethal Weapon 3 has been released on VHS and DVD numerous times. The first DVD was released in 1997 and featured the film's theatrical version. The 1997 DVD contains both the widescreen and the pan and scan editions. The Director's Cut was released in 2000. Since then, numerous sets have been released that contain all four films in the series (featuring the same DVDs). The film was released on Blu-ray Disc in 2011. Several versions of a Lethal Weapon video game were released in conjunction with this sequel's release, appearing on the NES, SNES, Game Boy, Amiga, Atari ST, and Commodore 64 platforms. Also released was a Lethal Weapon 3 pinball game. Lethal Weapon 3 (Original Motion Picture Soundtrack) was released on June 9, 1992 on audio cassette and CD. The soundtrack was performed and composed by Michael Kamen, Eric Clapton, and David Sanborn. Its title songs, "It's Probably Me", and "Runaway Train" were written and performed by Eric Clapton with the assistance of Sting and Elton John respectively. In 2013 La-La Land Records issued the complete score on a two-disc set as part of Lethal Weapon Soundtrack Collection. "Leo Getz Goes to the Hockey Game"
"God Judges Us by Our Scars"
"Lorna – A Quiet Evening by the Fire"
Tracks with one asterisk are previously unreleased, tracks with two asterisks contain previously unreleased material. ^ a b Fabrikant, Geraldine (1992-05-12). "THE MEDIA BUSINESS: ADVERTISING; Warner's Sequel Weapon Cuts Down Promotion Costs". The New York Times. Retrieved 2010-11-08. ^ "Lethal Weapon 3 Role Brings Stardom To Rene Russo". Chicago Tribune. 1992-05-24. Retrieved 2010-10-03. ^ John Chandler (1991-12-10). "Tract May End in Blaze of Film Glory : Lancaster: The city is talking to filmmakers who may want to burn down an abandoned development as part of 'Lethal Weapon III.'". Los Angeles Times. Retrieved 2016-07-30. ^ "The Jeffrey Boam interview, 1992". ^ "Not a Sequel: Robert Mark Kamen on Taken 2, Bloodsport and Karate Kid - CraveOnline". 8 October 2012. ^ "Carrie Fisher Filmography and Movies". ^ a b Wheeler-Dixon, Cheryl. "Lethal Wheeler Still Using Her Weapons". Black Belt. Vol. 30 no. 6. Rainbow Publications. p. 11. ISSN 0277-3066. June 1992. ^ Baker, Tim. "Holy Stuntfighting, Batman!". Black Belt. Vol. 35 no. 7. Rainbow Publications. p. 35-38. ISSN 0277-3066. July 1997. ^ Fox, David J. (1992-06-01). "'Lethal Weapon,' 'Sister Act' Pack a Sales Punch : Box office: The two films dominate weekend ticket action. But 'Far and Away,' starring Tom Cruise, lags behind". Los Angeles Times. Retrieved 2011-01-12. ^ "`Lethal Weapon 3` Holds Off `Alien3`". Chicago Tribune. 1992-05-29. Retrieved 2010-10-03. ^ Fox, David J. (1992-05-19). "'Lethal Weapon 3' Destroying Records". Los Angeles Times. Retrieved 2010-09-11. ^ Hunter, Stephen (May 15, 1992). "'Lethal Weapon 3' reprises slapstick formula". The Baltimore Sun. Retrieved September 10, 2010. ^ Canby, Vincent (May 15, 1992). "Review/Film; Glover and Gibson Together Again: 'Lethal Weapon 3'". The New York Times. The New York Times Company. Retrieved September 11, 2010. ^ "Lethal Weapon 3 (1992)". Rotten Tomatoes. Fandango Media. Retrieved April 13, 2018. ^ "Lethal Weapon 3 Reviews". Metacritic. CBS Interactive. Retrieved April 13, 2018. ^ "CinemaScore". cinemascore.com. Retrieved April 13, 2018. ^ Ebert, Roger (May 15, 1992). "Lethal Weapon 3". RogerEbert.com. Ebert Digital LLC. Retrieved April 13, 2018. ^ "lethal weapon - Movies & TV". Amazon.com. Retrieved 2011-07-27.